« We’ve had a very nice day’ and I’d say today’s Transju 50 CT was one of the best races ever for us” said Iwana and Joseph Kral. Yes, you are right and this year we had on Saturday for the classic race and on Sunday for the skating a fantastic weather : sonny and a lot of snow. 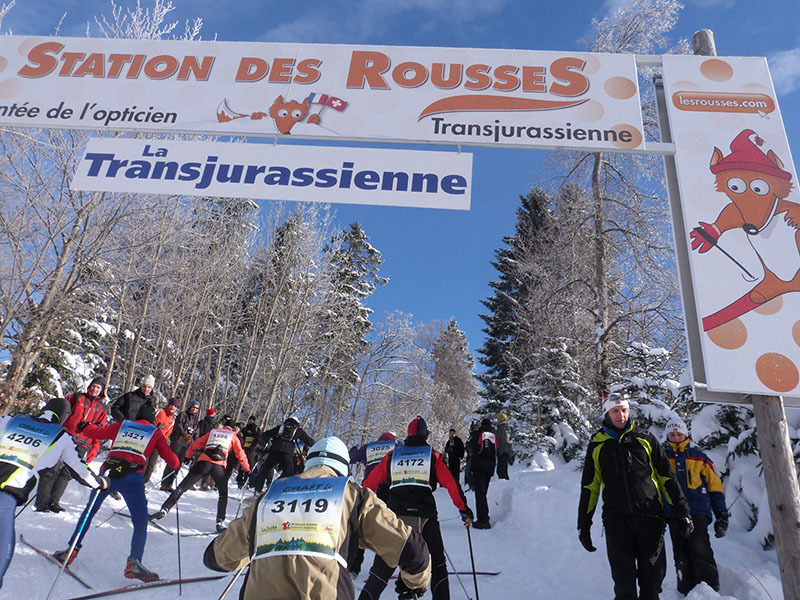 No problem with the wax on Saturday : “an enchanting forecast with sun, no wind, ideal temperature, trees dressed with snow : I wanted to stay in the Risoux Mountain to have a picnic” said Gille Carré. But it was not the same on Sunday ! 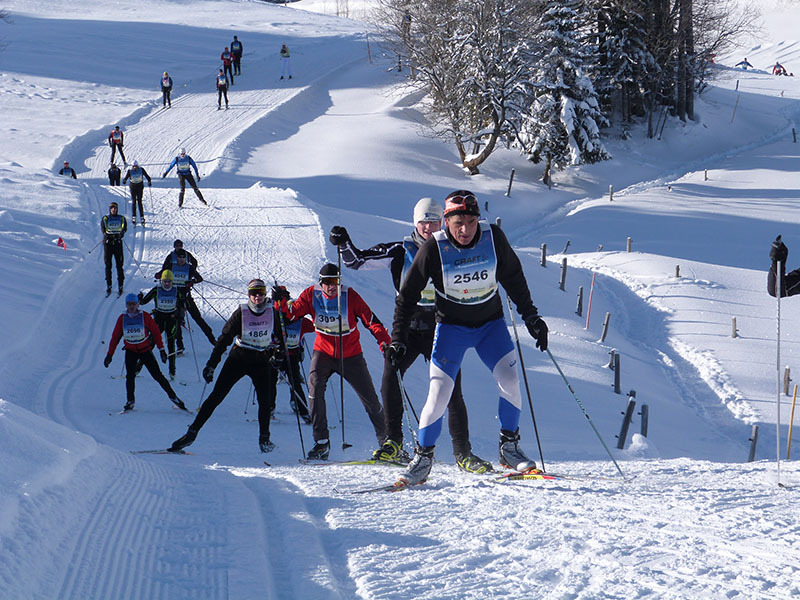 Snow was so cold and dry that it was terrible: no glide during 76 km. 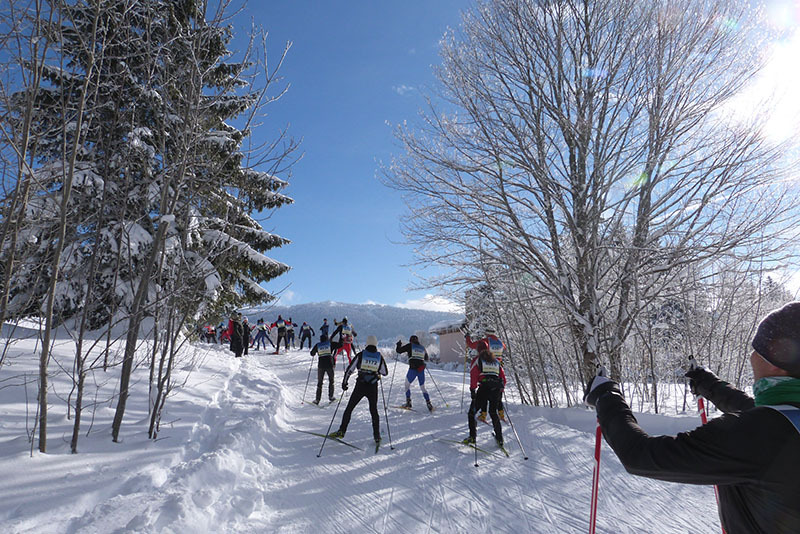 Minus 20 at La Combe du Lac and all during the race till Bellefontaine (50th km) and a small but permanent front wind, when forecast announced minus 8 at the start and minus 2 after 10 o clock! It was my 17th Transjurassienne and I think it was the more difficult I never run. Happily they were a lot of people, children, families, skiers along the tracks every where ! In Premanon, Les Rousses, Le Brassus (in Swiss) Bois d’Amont, Chapelle des Bois, Mouthe : always encouragements and well done ! For me, every skier who finished this year the 76 km FT Transjurassienne merits a double stamp on his WL pass !! We had the time to look at the lovely landscape, particularly during the long climb to the “Chalet des Ministres “ ! But what a Minister was making here ? Perhaps speaking about the wood grouse who live there and take pleasure to admire the WL skiers two days a year ? Congratulation to the organizers: it was perfect this year. No traffic jam, the buses were in time to go and come back, good food at the finish, showers for everybody. Just one precision : what can I do wis 17 caps ? Can you next year found on other gift ? And the winners? A French podium in 2013 : Benoit Chauvet, Emilien Buisson and Adrien Mougel (less than 3h30), Christelle Jouille, Anne Laure Cuny and Perrine Blanc (about 4h30) on the 76 FT.
Yann Guigonnet (2h38), Matthieu Fuchs et Jéremy Burri (3 h), Celia Bourgeois (2h44), Stéphanie Sauter (2h48) and Valentina Shevshenko (2h49) for the 57 FT.
Pierre Guédon, Bastien Buttin and Bertrand Hamoumraoui (in 2h24), Gaëtane Perret, Marie Colin and Iris Pessey (in 2h45) for the 50 CT.
Franck Malchiodi : 4h28, Thomas Huber : 4h54, Boris Petroff : 7h02. Romain and Isabelle Petroff, stop at Bois d’Amont, Alexis Petroff, stop at Bellefontaine. Joseph and Iwana Kral : 2h31. Special congratulation to Hannes Larsson who run the 50 CT on Saturday and 57 FT on Sunday ! The conditions were exceptional in classic. 50km almost too short, why not 76km. This year a vendor gave me good advice : Wax manufacturers (swix) allways recommend the most expensive wax, I think that in cold, dry weather this is not the best for grip and glide (fluor not recommended).